I have some exciting news to share! The Raised By a Canadian Farmer logo is now being used at Swiss Chalet! I’ve talked about this logo before and why it matters to me. It gives me confidence because I know that the chicken in my meals at the restaurant are raised to the highest standard of care in both food safety and animal care. Plus, I like knowing that the chicken my family is eating is from Canada. I love to support our Canadian chicken farmers. We used to eat at Swiss Chalet often when we lived in Edmonton. Sometimes we ate at the restaurant, but we also got our meals delivered right to our door. I miss it! Swiss Chalet has delicious food with a “home cooked” feel. They are the type of food I can imagine my grandma making us for one of her special dinners at her place. The rotisserie chicken is so tender and juicy! I really need to go to Ottawa and find a Swiss Chalet restaurant soon! Now I’m craving their yummy food and want to look for the Raised By a Canadian Farmer logo. In the meantime, I’m bringing Swiss Chalet to my kitchen. I browsed their menu and selected a recipe I wanted to try. It’s not exactly the same as I didn’t have the recipe and am creating my own version. I wanted something healthy, fresh and vibrant. 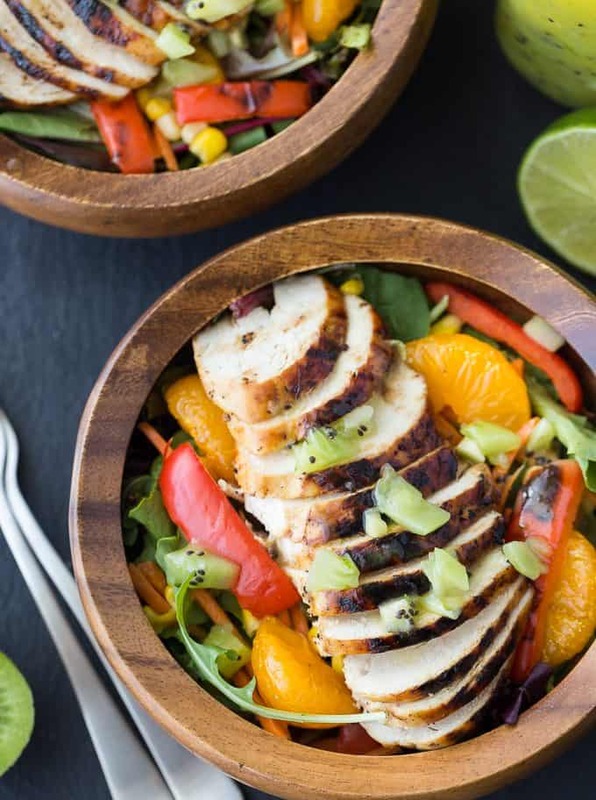 This Sweet Heat Salad is exactly that! I’d say my salad is more sweet than heat. I used Thai Chili Sauce to marinade the chicken for the “heat”. 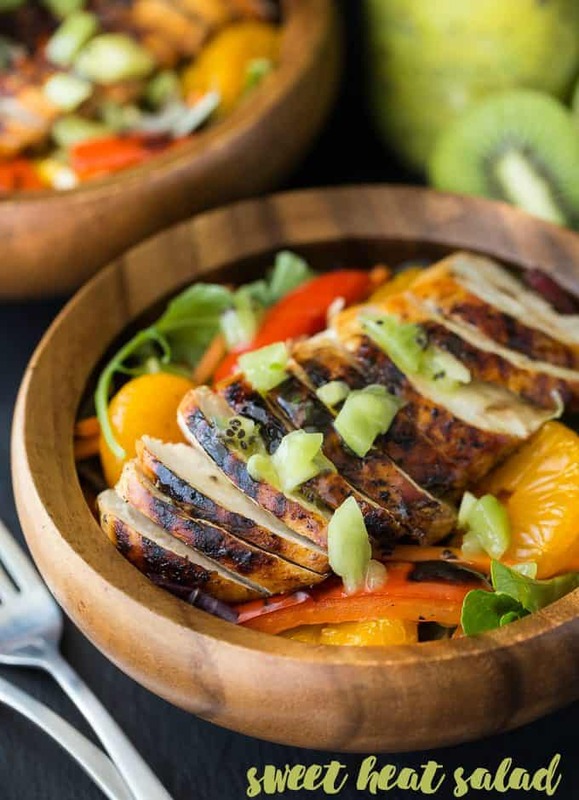 The “sweet” comes from the Kiwi Lime dressing and mandarin oranges. I grilled the chicken breasts and the red peppers because I cannot get enough off my new barbecue. You could bake them too and it would still work. 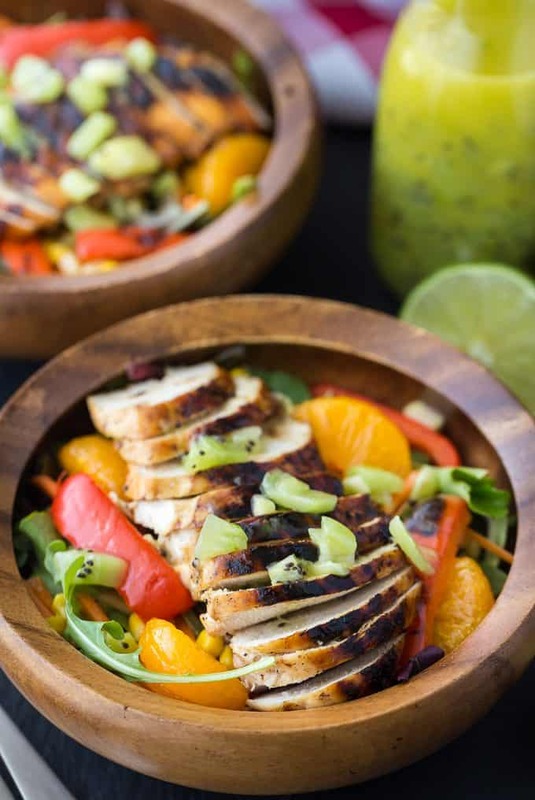 Add mixed greens, julienned carrots, mandarin oranges, grilled red peppers and sliced chicken breasts to a bowl. I laid my chicken on top for pretty presentation. Once the photos were over, we tossed it up in the bowl with all that sweet lovely dressing. This salad is a filling meal in itself! Now I’m curious to go to Swiss Chalet and try their version and see how it compares. You might also like this Greek Chicken Salad. How often do you eat at Swiss Chalet? A little bit of heat and a lot of sweet! 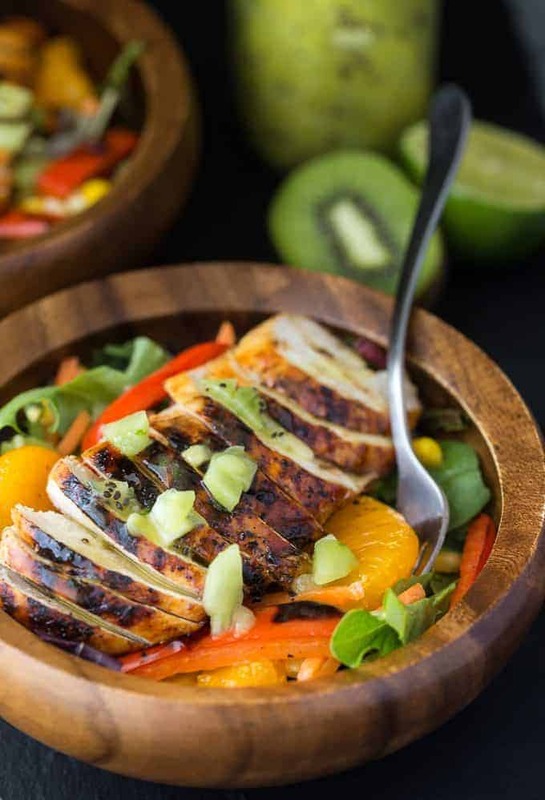 This salad is vibrant, healthy and delicious. It’s my version of the Sweet Heat Salad from Swiss Chalet. Brush Thai sauce over chicken breasts. Let sit in the fridge for a couple hours. Preheat BBQ to medium high heat. Cook for about 15 minutes or until chicken is done according to a meat thermometer. Flip often. If you find they are starting to burn, turn the heat down to medium. Add red peppers to a grill basket and grill for about 5 to 7 minutes on medium heat, flipping often. 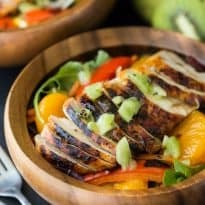 Combine mixed green, red peppers, mandarin oranges, carrots, corn and chicken to a large bowl. Toss to combine. In a small mixing bowl, whisk kiwi, olive oil, lime zest, lime juice and honey. Pour into a bottle and drizzle desired amounts over individual salad bowls.